Granite Homes has released a limited number of townhomes from the third phase of its award-winning Gallery Towns community. The release, available since Sunday, includes five townhomes at the desirable South Guelph site, at 60 Arkell Road near Gordon Street. Each of these spacious townhomes features a walkout basement, master balcony, more than 2,100 square feet of living space and open-concept floorplans. The interiors boast three bedrooms as well as two bathrooms, a powder room and an optional guest suite, making them ideal for families or even simply entertaining. Construction on the first two blocks at the Gallery Towns site is well underway and two models are already scheduled to open in late October. One model is an interior unit, which showcases the optional elevator, available in any unit, while the other is located on a corner lot. Gallery Towns’ modern eye-catching exteriors, which contrast black clay brick with Maibec siding, have already been warmly received. While work continues at the site, the homes have won an award from the Guelph and District Home Builders Association. The community snapped up the Most Outstanding Architectural Design award in the multi-family category last year. This distinction echoes the success of Granite Homes’ Arkell Lofts, located adjacent to Gallery Towns, which racked up multiple awards itself, including the 2015 Ontario Home Builders’ Association’s Most Outstanding Attached Multi Unit Home award. 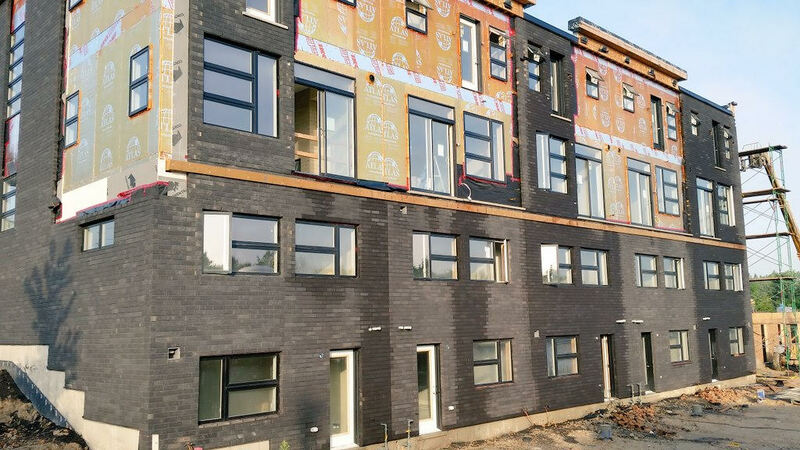 Both developments are in a part of Guelph marked with tree-lined streets and trail-traced woodlands while still affording easy access to the urban amenities the city of 115,000 thousand residents has to offer. To learn more about Gallery Towns by Granite Homes, visit gallerytowns.ca or call 519 822 3988.